Last two years marked an exponential growth for social networking sites across the world, gaining momentum from the early boost they had in the year 2007. Facebook alone accumulated over 350 million by end of 2009, of which the last 100 million came up just within few months. In August 2009, Facebook noted that they are already cash-flow positive, with the help of their innovative advertising platform which allows micro level ad targeting for marketers. Remarkable fact is, all this growth took place, in an era where everything else was heading directly downwards. Other social networks too did quite well in accumulating users during 2009, but the profit potential for these sites are still questionable due to the lack of a stable revenue model. Selling advertising space to third party companies might not be a sustainable model in the long run, as people are becoming more and more advertising-proof on these social networking sites. When more and more low quality advertisers (mostly spammers) come online on Facebook ads (and other social network advertising programs), people will start to suspect the trustworthiness of ads being delivered to them. This type of low quality advertising accounted for the rapid drop of click through rates (CTR) on Google Adwords, during the years of 2007 and 2008. Given this scenario, it is at high risk for these social networking sites to trust selling advertising space as their primary revenue model. The other alternative practiced by some social networks is charging a premium free for additional privileges. Linkedin.com, Ning, and WAYN remains to be the best examples of trying this strategy. However, this still is a risky venture to depend on too much. Internet works best, when people have free access to information. Everything else on internet is promising more free stuff, starting from free POP3 email, free web analytics, free online document sharing, and free domain hosting. The minute someone else comes up with the same premium features on Ning for 100% free; the entire revenue model of Ning will be in turmoil. (No one ever expected to see an “enterprise level web analytics tool” for 100% free). The problem faced by popular social networking sites for monetizing their scale (volume of users) can be termed as the “revenue model trap”. These sites have grown so rapidly in size, but working out a sustainable revenue model remains a problem to date. On the other hand, we see a totally different problem faced by the eCommerce firms. Ecommerce firms, over last two to three years discovered social media to be a silver bullet solution for cutting their marketing overheads and grow organically through C2C recommendations on social networking sites. Social Media Marketing (SMM) and Social Media Optimization (SMO) were the latest buzzwords during years of 2007 and 2008, but by 2009 many eCommerce started to see the results were not that attractive as the so called experts predicted. eCommerce firms attracted towards social media marketing, mainly due to the massive wealth of user generated content on those social media sites. They realized, if some of these user generated content can be associated favorably with their brands, they could yield attractive commercial benefits. However, one fundamental barrier they have to break was the gap between a community orientation and transaction orientation. Most online communities rejected commercial motives within their community. This forced eCommerce sites to move slowly than they wished, when marketing their products on social media web. Those who went too aggressive were kicked out of communities for guilt of being greedy. Those companies which quite comprehensively understood the nature of social media went with a little bit low in aggression and harvested sufficient return on investment. They quickly realized that, people trust other people on social networks, than what companies say in advertising, and they figured out ways of how to get into these conversations and grab a sale or two from these social media channels. Eventually, they started to notice that if these C2C conversations on social media sites can generate the bulk of their revenue, they can cut on advertising overheads on Search Marketing and other mainstream advertising budgets. They realized, if they can scale these social media marketing efforts little more up, they could multiply the returns my many times. With this objective in mind, companies spent a remarkable amount of money on Social Media Marketing, during 2009. Some companies went on to convert their entire business model into a social media driven strategy, while some companies launched their own online communities to be in control of conversations. However, to their surprise the scaling up of social media marketing didn’t work as they expected. With the scale of social media becoming larger than it deserved within their horizons; they lost focus on commercial interest of the firm. Suddenly they realized, the silver bullet doesn’t work as experts promised. Although social media could contribute positively towards commercial performance of a business; such contributions are not scalable in the longer run. There are some evidence out there, that most companies who embraced social media as a core strategy of their business, struggled to yield tangible results , mostly due to the mismatches between their core business values, structure and mental models (profit centric, task oriented) and core values of social media (community centric, socially oriented). The problem faced by these business entities in achieving large scale results from social media marketing can be labeled as the “scalability trap”. Businesses know social media works, but they don’t how to make it work big. Small incremental changes will never going to keep them competitive in the dynamic environment that they have to carry out their business. On one hand, we have rapidly growing social media sites which attract attention of millions. A huge wealth of social knowledge is created on these websites, based on vibrant conversations, shared content and expert opinions. A considerable amount of these user generated content and conversations relates to consumption behaviors, which heavily influences the purchase intentions of individual consumers. However, these sites continue to fail in monetizing this growth, and mammoth amount of social knowledge generated on their domain in a meaningful manner. On the other hand, we have business firms with sound revenue models who sees the opportunity in growing popularity of social media web. But they face the problem of sufficiently scaling up their social media efforts, to generate a sizable share of revenue from these social media channels. In between these two extremes, there stands the untainted playing field for a new kind of a business venture. The opportunity is there for a new business model for a truly “social commerce” business. In a previous post on this blog, I discussed the essential difference between using social media for promoting and existing product, and being a truly social commerce business. There I defined social commerce as “using social interactions on the internet, to create commercially viable product ideas and facilitating the exchange process of such products”. In today’s business context, competition is irrelevant for such a business. Lulu.com is an online bookstore. But it’s different from Amazon.com to a greater extent. Unlike on Amazon.com, Lulu.com features books written by the members of its community. Lulu.com is a community of individual authors, who come online to publish their books. You don’t have to go after a big publisher for publish your own book. At Lulu.com, you can write your own book, publish it as an eBook, Paperback, or Hardcover format virtually within just minutes. A large number of books sold on Lulu.com are written by amateur authors. Unlike many other social media websites, trapped in the revenue model problem; Lulu.com is leveraging the power of their community to bring an uninterrupted cash-flow to run their business, and earn profits. Because there are millions of problems unsolved for human beings, and there are very little number of professional authors ready to write books for solving these problems. Lulu.com fills these micro level niche segments, by connecting people with problems (potential readers) and people with the solution (potential authors). Not everyone is ready to write “The Ultimate Bible of Tattos”, but if you write a one, there are more people than you think ready to read it! (Check the Lulu sales rank for this book. It’s ranked #9 among hundreds of thousands of books published on Lulu.com). If you are someone with a sound solution for an ignored problem; well you have already found your niche on Lulu.com! 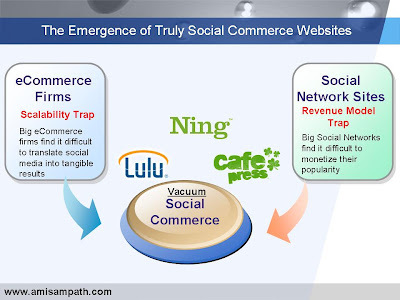 The future of social commerce is written to be ruled by companies like Lulu.com. The way things are heading at the moment is towards a highly personalized world. Products appealing to the masses or for segments are not going to be the “thing” for the future. The technology is enabling the theory of “mass customization” more realistic more than ever.